Teal. Formal Beaded Neck Jacket Dress. Sz. L. Midnight Velvet. Beaded Neck Jacket Dress. A pretty beaded flower adorns the fluttery jacket of this lovely 2-piece dress set. Dress has beaded V-neck. Polyester; dry clean. Available only in Teal. White. Mercedes Sequin Cape Dress. Sz. 24. Midnight Velvet. 38" l. Polyester/spandex with polyester chiffon overlay; hand wash. Midnight Velvet. R& M Richards Dark Beige Lace and Sequins 2- Piece Size 14 In Almost In Unworn. Condition is Pre-owned. Champagin Beige. Swirl Jacket Dress. Sz. 1X. Midnight Velvet. Searching for a long formal dress that’s flowing and flattering, yet glamorous enough for a very special occasion?. Our sleeveless maxi dress is simply stunning, with sensuous swirls of sequins and beads front and back for understated drama. Pink Jacket Dress by Ashro. Long sleeve jacket with rhinestone trim. Sleeveless dress with back zipper. dry clean. Pink elegant duo. Gorgeous formal Alex designer dress in Deep Purple. There is embellishment on the sleeves and at the bottom of the v-neck. The underlayment of the dress fits rather snuggly, but the top overlay is loose so that it hides figure flaws. The skirt is gored and very graceful when walking. I have taken pictures of the measurements of the bust and the length. This dress is probably only been worn about one time. If you have any questions please contact me. Thank you for looking at my treasures! NETTING UNDERLAYER ATTACHED TO LINING STARTS FROM HIP LEVEL TO HEM GIVES SKIRT ADDED WIDTH WHEN WORN. PIC SHOWS NETTING UNDER THE WHITE TOWEL. FULL LINING. 3 LAYERS OF MATERIAL = POLYESTER LINING, NETTING, SATIN OUTER. An Original Monica Edwards Illusion Dress. Color is Mauve. Beautiful dress features a round neckline with 2 button closure in the back. The bodice and sleeves are embellished with a scattering of pearls. Size is 18W. An Original ML Studio Skirt Suit. Beautiful ensemble that features a skirt with a full polyester overlay skirt. The skirt has a flat front waistband-back elastic-left side zipper-1 button closure. Poppy Floral Jacket Dress Beaded Midnight Velvet. Dress with bias lining; sheer jacket. 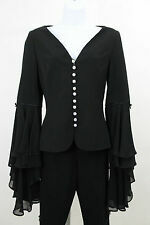 An Original Chancelle Skirt Suit. Gorgeous suit that features a skirt with flat front waistband-side elastic-back zipper/bar-hook closure. The jacket has a V neckline- classic notched lapels with buckle accent and 3 snap closure. An Original Onyx Nite Dress/Jacket Set. There is a back zipper closure. 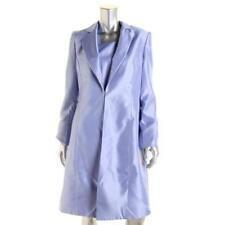 The entire dress and jacket has a sparkle effect to it in a baby blue color. The jacket is worn open and the shoulder pads are removable. SATIN A-LINE GOWN WITH SCOOP NECKLINE. I LOOK OVER EVERY DRESS BEFORE I LIST IT. THIS CHART IS AN APPROXIMATE SIZING. DESIGNERS VARY FROM SIZE TO SIZE. OTHERWISE, THE DRESSES ARE IN GREAT SHAPE! Full Length (Hollow to Hem). Tionne Dress. Will arrive wrinkled. mother of the bride dress size 12. Shipped with USPS Priority Mail. mother of groom dress 14 very fitted . Condition is Pre-owned. Shipped with USPS Priority Mail. alex evenings 2pc Dress Suit Size 20W. Condition is Pre-owned.Suit is in excellent condition. Suit is 75% rayon and 25% polyester. Collar is 85% rayon and 15% polyester. Lining is 100% polyester. Dry clean only. Message me for questions regarding the item. Shipped with USPS Priority Mail. Women's Plus Size 20W 2-piece Mother of Bride/Groom gown Light Gold NWT. Women's Plus Size 20W 2-piece Mother of Bride/Groom gown Light Gold NWT.. Condition is New with tags. Shipped with USPS Priority Mail. Seychelles Pant Suit. pull on pant with 31" inseam. White lace full-length jacket features hide-a-way button closure. a satiny mid panel and an alluring notch collar. Matching satin tank style top and. L. Midnight Velvet. Loose fit pants and tank are lined. 32" inseam. Dry Clean. Elegant R&M Richards formal cocktail evening dress! Beautiful lace and sequins TWINKLE LIKE DIAMONDS! Sequined Lace Jacket & Dress. Bolero style. Sequined laced & lined bodice. Sleeveless sequined laced & lined bodice. R & M Richards. Full length straight chiffon wrap skirtwith deeper tone free-hanging attached lining. Round neck and slip on style makes this a very versatile dress. Lettuce hems. Colors of orchid,moss, and mauve on a cream background. Size is 20W. An Original Studio C Illusion Dress. Color is Cream Floral. New ListingCocktail dress and jacket size 10 European designer Linea Rafaelli: unique! Ursula of switzerland 2 Pc Mother Of The Bride Dress Size 16. This is a beautiful elegant off white lined flowing outer layer, dress has spagetti straps and belted the cover jacket has sequins all in tact Condition is Pre-owned it is clean but has been hanging for awhile no stains will need to be pressed, this is a great deal ,length will be at or below knee,please view all photos as they are part of the description thank you smoke free and clean and fast shipping priority mail thank you have great day! Beautiful ankle length formal dress. Soulmates Silk Crochet & Beaded 2 Pc. Fabric: Silk. Dress Sleeve: Sleeveless. Jacket Sleeves: 17". Total Length: 54". Length: Hi - Low 18-21". Waist: 30". Beautiful lace Navy Blue with beading. mother of the bride dress XL. Tall I am 5’ 8” never altered. Shipped with USPS Priority Mail. plus size formal dresses 22w. Condition is New with tags. Shipped with USPS Priority Mail. Never worn. Silver Lace top over a silver gray gown mother of the bride/groom dress size 14. Condition is Pre-owned. Worn once dry cleaned and packed away. Shipped with USPS Priority Mail. 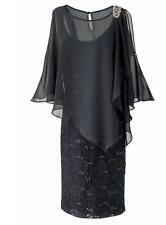 Donna Morgan lace gown. Tried on but never worn. I bought this from Saks Fifth Ave, Off 5th. It is a romantic lace gown in a long silhouette. Boat neck, capped sleeves. Back zipper, hook and eye closure. An Original Dress Barn Dress. Color is Navy. There are diagonal hem lines on the tiers that alternate in direction. Lettuce style hems. Size is 14. Fabric: 100% Polyester. Georgeous Mother of the Bride Size 10,Montage by Mon Cheri Designer Beautiful! Besides your own wedding, one of the most important days of your life is likely to be watching your child get married. Therefore, since it is also one of the most photographed days of your life, it is essential that you choose the right, elegant mother-of-the-bride dress or outfit. If you are trying to select one of these dresses, then you are likely to have many questions. What are some fabric choices for mother-of-the-bride dresses? Satin: A sleek and glossy fabric with a brilliant shine. Chiffon: A lightweight, plain-woven fabric. Velvet: A smooth, woven-tufted fabric. Crepe: A crisp fabric with a crimped appearance. Charmeuse: A lightweight, lustrous fabric with reflective properties. Organza: A thin, plain-weave fabric. Which dress length is appropriate for the mother? The mother of the bride can wear any length she chooses, although she may want to consult with the bride. There are modest, short, knee-length, and long dresses, some with lace, that are suitable for wearing to your daughter's wedding. For a plus size mother, there are several elegant plus size short sleeve or long sleeve options. A beaded jacket or sheath can add to the style. What styles of mother-of-the-bride dresses are available? There are many different mother-of-the-bride dress designs that you should consider. A-Line: Dresses with a sewed-on fabric belt or another way to gather them at the waist are called A-lines. Babydoll: A spaghetti-strap top and a loose fitting skirt helps to naturally draw the viewer's eyes up to your face when worn with statement jewelry. Bodycon: These hug the body snugly from the shoulders to their bottoms. Empire-waist: A tight-fitting top ending just below the bustline accents the full skirt. Kaftan: Flowy fabric and flared sleeves make this a good choice for a casual setting or an outdoor wedding. Peplum: A narrow skirt and a ruffle at the waist helps to create a slender illusion. Skater: A frilly bottom under a gathered waist. Steth: This style hangs from the shoulders in a straight line. Trench: These dresses have large buttons down the front, and they usually have a belt making them resemble a trench coat. Shirt: Similar to a trench dress, but with smaller buttons, these dresses are usually constructed of cotton. How do you choose a dress? Choosing a mother-of-the-bride dress can become a mind-boggling experience with so many choices available. Following some helpful steps will allow you to end up with the correct choice for your daughter's wedding day. Select a style: Empire-waist, A-lines, trench, and steths are all obtainable. Select the length: Consider which length you like to wear, along with how formal the wedding is going to be. Select the size: Dresses are available in a number of different sizes to fit your body type. Select preferred materials: There are many different choices of fabrics available. Select sleeve length: Short, medium, or long.